In a way, Suzuki’s Jimny cute ute looks a bit like a Mercedes G-wagen left in the dryer a bit too long. It’s a capable off roader, and a totally rad little piece that we unfortunately are forbidden from having on this side of the Atlantic. What it isn’t, though, is heavy or powerful like Mercedes’ rolling fortress. Just for the hell of it, CarWow decided to pit the two against each other in a tug of war. Who do you think is going to win? Obviously the Mercedes has a weight-induced traction advantage. As soon as the Jimny starts to spin its tires in the wet grass, it has lost any semblance of forward momentum. Unlike in the Fast and Furious universe, doing a burnout in the real world doesn’t help you pull a bank vault out of a wall, and it won’t help a Jimny pull a G63. 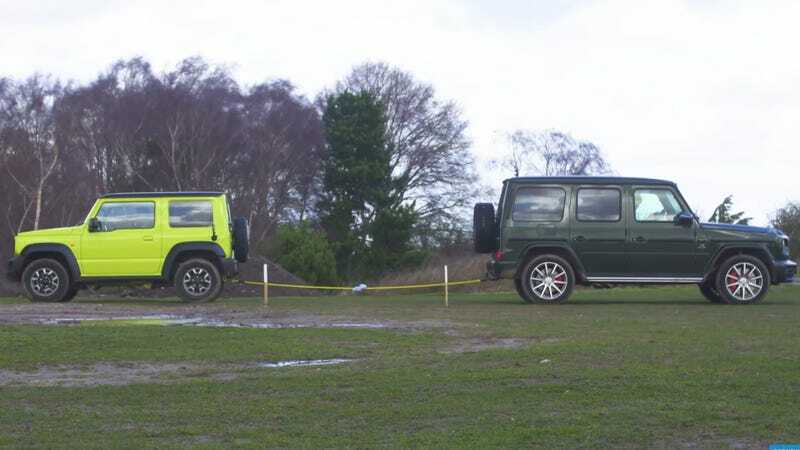 What happens when you add a second Jimny? Well, the two cars still don’t add up to the weight or power of the G63, so it still wins, but less emphatically. Add a third Jimny and your pull train of horses might have enough torques to make it happen. It’s a fun video that adds a dash of absurdity to your day. Give it a watch. The Mercedes-AMG G63 Goes How Fast?